Right now the CBR folks are asking you to get your vote on and pick the Top 75 Moments in DC Comics History. No easy feat when you’re talking a company whose past includes Watchmen, Green Lantern: Rebirth, and the death and return of Superman. Forget the words around it, this picture said it all. 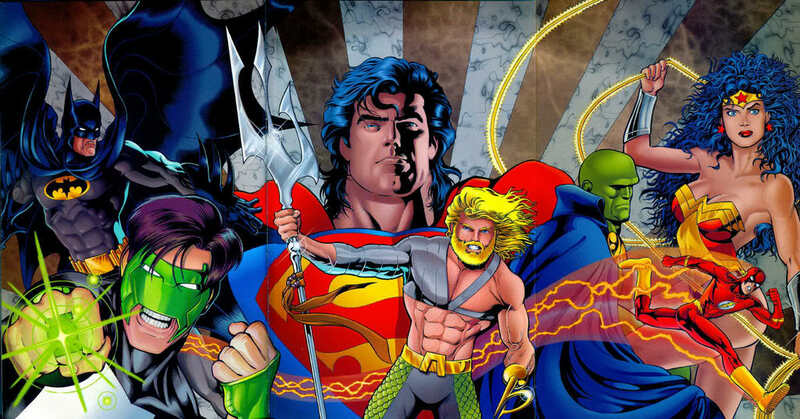 DC was finally bringing back the 'Big Gun' Justice League. Aquaman, Flash, Batman, Wonder Woman, Martian Manhunter, Superman and Green Lantern all in the one book. Even Mark Waid’s plot was irrelevant – if the League was reforming I was going to be there – right after I finished ‘wowing’ over that ad. So that's mine done - what was yours? In 1986 I used to get my comics from a subscription service called Westfield. Every Wednesday (I think) there would be a box of minty fresh comics waiting for me when I got home from school. One week, I knew that Batman: The Dark Knight Returns #1 was waiting for me in that box. And even though I was loaded down with a backpack full of books, I remember running home as fast as I could to get to that box. I was not disappointed. Wow Rob! That's an awesome answer - thanks! It took me years to finally get Batman The Dark Knight Returns. Even after all the hype I'd read it was still sensational stuff.